'Pringles Jingles' is a UGC TV ad competition being run by Pringles in the UK. The Pringles Jingles competition offers the chance for someone to create, and star in, their own TV ad for Pringles. 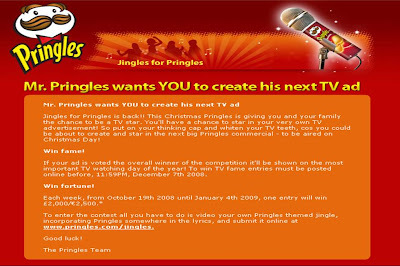 Videos for the Pringles Jingles competition need to be posted through http://www.blogger.com/www.pringles.com/jingles and the deadline for submission is December 7th. The ad with the most votes will be screened on Christmas Day in the UK and there is a weekly prize of £2,000.